Nigeria coach Stephen Keshi has said he is very disappointed he is owed more than seven months salary, describing it as his worst experience as the country’s coach. 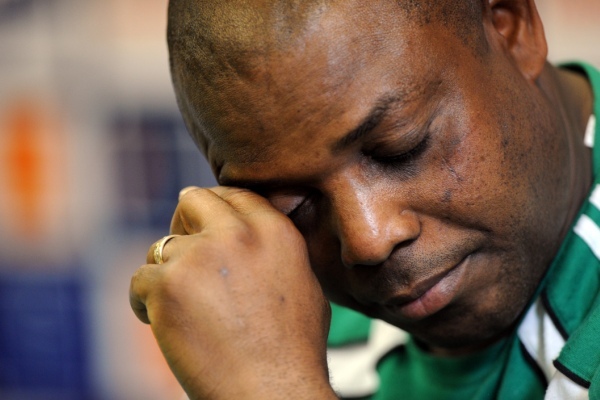 Keshi is on a monthly salary of five million Naira (31,500 dollars/22,800 euros). He led Nigeria to their third Africa Cup of Nations triumph in February and he is only a game away from qualifying the country for the 2014 World Cup in Brazil. The ‘Super Eagles’ won 2-1 in Ethiopia in a first leg playoff and will host the return match next month in Calabar. Keshi is approaching two years at the helm of Nigeria and he told reporters that being owed salaries for many months has been his most disappointing experience as the coach of Nigeria. “The lowest point of my career is working and not being paid for seven to eight months. I have never had this kind of experience before,” the former Nigeria captain said. “In Mali, they will never owe you. Your salary will hit your account before the end of every month. It was the same thing in Togo. “Owing me up to seven months makes me feel I am not being appreciated. It is like they, my employers, think I am being favoured in what I am doing. “If they say we can work for free and that they are not going to pay, so be it. The NFF have said they are broke and have already been forced to slash the national team’s win bonus of $10,000 by half.